Well, we’ve made it to the ruminants! These are the animals that will best convert solar energy into marketable product. Ruminants take the solar energy collected by the grasses and other plants in the pastures and turn them into meat, milk, wool, and other products. They are uniquely endowed by evolution with an organ that allows them to gain nutrition where other animals cannot – the rumen. We’ll definitely have sheep, and we’ll probably have some goats. I’m a little concerned with the fencing for goats in terms of keeping them on our property and out of the gardens, food forests, etc. But I’ll put them in the post anyways because we are certainly considering them. Goats can be used for meat, milk, hides/fleece, and for clearing land. The meat and clearing are the products in which we have the most interest. We don’t want dairy goats for several reasons, including the need to milk them every 12-24 hours and the fact that there is a dairy less than a mile away from us where we can get fresh milk cheaply and very locally. I really enjoy goat meat (called chevon by some and cabrito in San Antonio where we’ve been living) and it’s really low in fat and cholesterol compared to other red meats. We also have more than half our property in woods and may need the land-clearing services that a few goats can provide. In short, I don’t think goats will be a major undertaking for us, but a small part of our diversified ranching operation. Sheep may be the first ruminant animal that we acquire. They are smaller and less expensive than cattle, and expense is definitely a concern with us right now. But we’ll need some ruminants to graze the pastures for us and leave behind their fertilizer to help build the organic matter in the soil. We eliminated wool sheep from consideration due to the heat and high humidity of the mid-south in the summertime and really looked only at the hair breeds of sheep. This eliminates potential profits from the wool, but also eliminates shearing. Hair sheep also tend to be more resistant to parasites than wool sheep. We also looked at high lambing rates and year-round breeding potential in each breed. Without further ado, here are the breeds of goats and sheep that we are still considering. 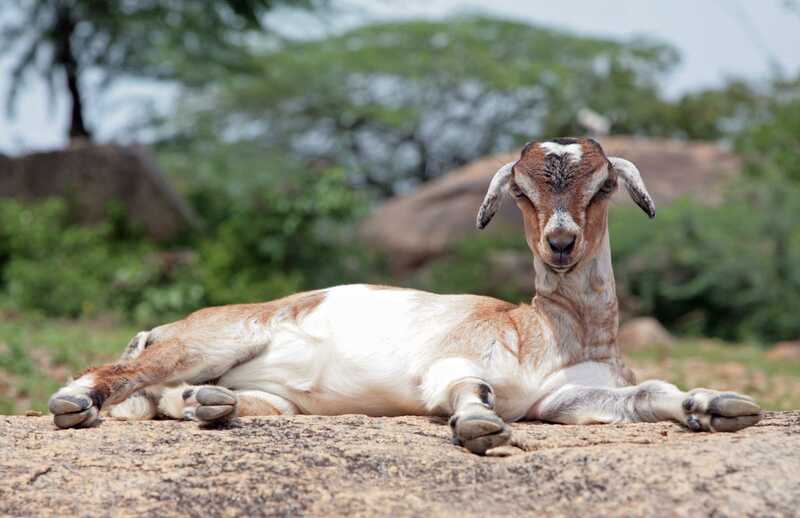 Myotonic or Tennessee Fainting – These goats can be heavily muscled because their muscles are constantly flexing and relaxing due to a genetic mutation. If startled, they’ll sometimes even fall over momentarily. It doesn’t hurt the goats at all. These goats are good for producing meat and for clearing brush. They also have the benefit of not being as escape-prone as other goats, because the relative stiffness of their muscles prevents them from a portion of the jumping and climbing that other goat breeds are capable of. Myotonic goats come in pretty much every coat color and eye color combination you can envision in a goat, and they are really prolific goats – kidding every 6 months in many does. They have a very high meat:bone ratio, mild flavored meat, and appear on the Slow Food USA’s Ark of Taste. Additionally, the breed is in need of conservation. The American Livestock Breed Conservancy (ALBC) places them on the Watch list. Boer – A goat breed developed in southern Africa. The premier meat goat today by many standards. It is a double-muscled breed, very climatically adaptable, and has true-breeding genetics. These goats spend more time grazing than other goats, but are obviously still goats and prefer to browse for their food when given the choice. Much larger than most other breeds of goat. I’d like to try some of these in the pastures, but I am a little worried about escape attempts. Katahdin – A hair sheep breed developed in Maine from Caribbean stock. They are efficient meat producing sheep in a wide range of climates. Many other farms around Good Life Ranch raise Katahdin sheep, so they may be the best sheep choice for our area and climate. Katahdins are very parasite resistant for a sheep and have a good lambing rate. They are listed as Recovering by the ALBC. St. Croix – Another Caribbean hair sheep breed that was developed further in the United States. The St. Croix has similar characteristics to the Katahdin, but it is much smaller. The upside is that the St. Croix produces more lambs more often than the Katahdin under most circumstances. They share a similar ability to resist parasites. However, although the Katahdin is a Recovering breed, the St. Croix is still listed as Threatened by the ALBC. It also appears of the Ark of Taste. Barbados Blackbelly – A very different-looking sheep! Very beautiful animals. This is another hair sheep that thrives in the hot and humid conditions of the mid-south that give wooled sheep trouble. They are very parasite and disease resistant. They are also prolific, often producing twins and triplets. Blackbellies lamb year-round, even in the heat of summer, and are good mothers. They are usually polled and are intermediate in size between the Katahdin and the St. Croix. It is another species listed by the ALBC, this time as Recovering.